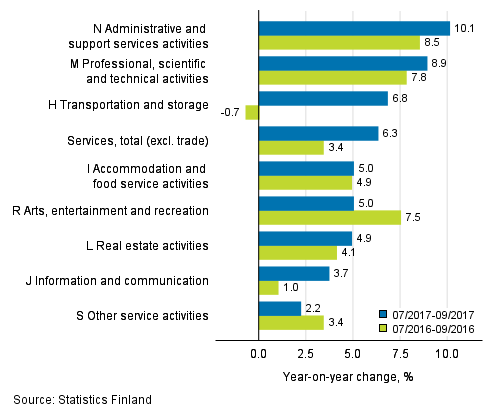 According to Statistics Finland, turnover in service industries grew by 6.3 per cent in July to September from the corresponding period of the year before. Among the industries, administrative and support services activities (+10.1%) and professional, scientific and technical activities (+8.9%) still developed most strongly. Turnover in transportation and storage also attained a good growth of 6.8 per cent. Turnover rose most moderately in other service activities (+2.2%). Services are here examined exclusive of trade. The industry of administrative and support service activities was boosted most by employment activities (+16.7%). Of the sub-industries, renting and leasing activities also grew strongly, reaching a growth of 15.3 per cent. The main industry of professional, scientific and technical activities was boosted by the 15 per cent growth in other professional, scientific and technical activities from the corresponding period of the previous year. Architectural and engineering activities and technical testing also grew strongly (+11.3%). The development of the industry was held back by research and development (-6.4%). The main industry of other service activities developed slowly. Of its sub-industries, the turnover of repair of computers and personal and household goods decreased by 10 per cent. Turnover in service industries will adopt base year 2015=100 from the January 2018 data. Data using the new base year will be published for the first time in April 2018. ISSN=1799-0998. September 2017. Helsinki: Statistics Finland [referred: 22.4.2019].